I've had a "Pin It" button on my blog for several weeks now. I had a general "Pin It" button that automatically showed up on each post. I didn't know that it wasn't working though! If someone would try to click on it, the picture would show up blank and wouldn't actually allow it to "pin". So, sorry about that! I did figure out how to add the "Pin It" button to individual posts, though. So, I thought I'd share with you. I'm not sure if you can add the "Pin It" button without being a member of Pinterest since you get the "Pin It" button through the "Goodies" page on Pinterest. 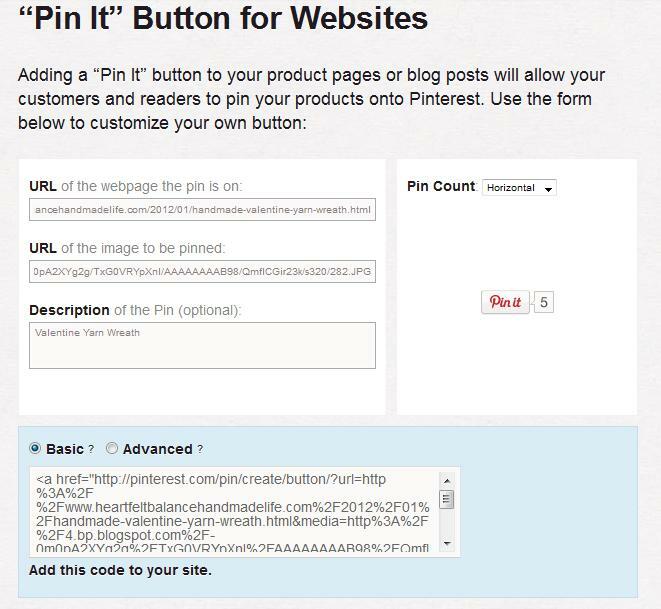 If you are on Pinterest, and would like to add the "Pin It" button to individual posts, follow the directions below. 2. On the main Pinterest page, go to "About" and click on "Pin It Button"
3. 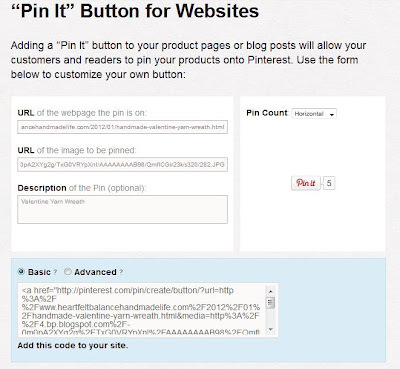 Scroll down to "Pin It Button for Websites"
4. Input your info into the spaces as shown above. *Note--You can get the image of the URL you are trying to Pin by right clicking the image and choosing "Copy Image Location". This will allow you to copy and paste the URL that you need to enter into the "URL of the image to be pinned" area. 5. Copy and paste the HTML code from the box in the blue rectangle into your blog post. Go to "Edit HTML" and paste the code either in the very beginning or very end of your post depending on where you want it to show up in your post. You can also find out how to add the Stumble Button to your posts while you're here!